An equilibrium constant gives a numerical representation of the position of an equilibrium. It is calculated in a homogenous system, this means one all substances are in the same phase for example liquid, or gas. Therefore we have different constants depending on this state. This is the equilibrium constant calculated using concentrations. It is calculated as follows. The value of Kc only applies at a constant temperature. If you are a bit confused by mathematics then this is the expression in words. 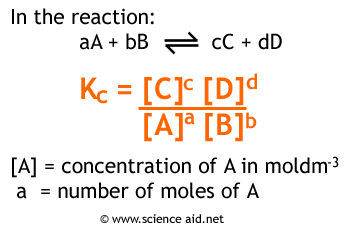 To calculate Kc you take the concentrations of the products, and then do each one to the power of the number of moles of it, from a balanced equation. Then do the same for the reactants, and divide products by reactants. If there were the same number of moles of both sides of the equilibrium, then the top and bottom would cancel, and there would be no units of Kc. This a way of getting the equilibrium constant when the system is a gas. In order to work this out, we first need to know the partial pressures of each molecule in the reaction. 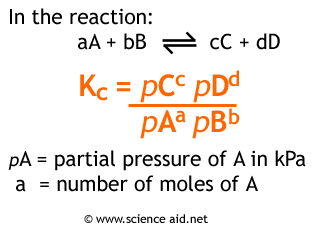 Now that we have the partial pressures, it is now possible to calculate the value of Kp. If you have a look at the material on equilibria you will see that the position of equilibria varies according to how conditions are varied. Le Chatelier's principle states that a system will oppose a change. To predicting how the value will change you must remember that the closer to the left the equilibrium is, the smaller the value of K is. Therefore increasing temperature shifts the eqilibrium in the endothermic direction. Changing the pressure only affects gases, i.e. it only alters Kp. So increased pressure will move the equilibrium to the side with fewer moles. What happens with concentration is a little more complicated, obviously this will only affect Kc and the key is that changing the concentration of one species will alter the concentrations of all other species so that the value of Kc remains the same. If the concentration of a reactant is increased the the equilibrium will move to the right to remove the product. Changes in concentration for Kc are equivalent to partial pressure changes in Kp. The use of a catalyst has no affect on the equilibrium constant or the equilibrium (it increases the rate of reaction in both directions).